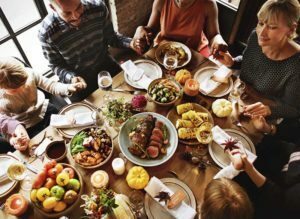 The holiday season is a particularly hard time to stay focused on a healthy diet for anyone and pregnant women are no exception. However, healthy eating takes on a different meaning during pregnancy. Being pregnant does not mean holiday eating cannot be enjoyed, pregnant women just need to be a little more mindful of what not to eat. There are some foods that should be avoided during pregnancy. While there are known benefits to eating and drinking dairy products, certain dairy products should not be consumed. It is important to avoid unpasteurized milk and cheeses that are made with unpasteurized milk. Avoid brie, queso fresco, feta and other soft cheeses. If you are a cheese lover, eat a hard cheese such as cheddar or parmesan and be sure the label states the cheese is pasteurized. The process of pasteurization is partially sterilizing a product, like milk, in order to make it safe for consumption by killing bacteria through heating to a certain temperature for a defined amount of time. Consuming unpasteurized dairy products can lead to illness from bacteria such as listeria. According to the Centers for Disease Control (CDC), pregnant women are 10 times more likely than other healthy adults to get ill from listeria. Listeria can cause a miscarriage and developmental issues for the baby. 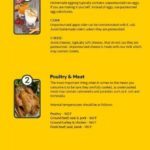 Your holiday menu is likely to include poultry, red meat, game or seafood, and you can certainly enjoy these foods, but be sure poultry and other meats are cooked thoroughly. Stay clear of fish high in mercury and do not consume raw shellfish. Undercooked poultry and meat, like turkey, can contain bacteria such as salmonella and listeria. Salmonella infections pass onto the fetus and cause issues after birth such as diarrhea and in serious cases meningitis. Another popular holiday dish is stuffing, and it is best to only eat stuffing that is cooked separately. Stuffing that is cooked within a turkey or other meat is susceptible to bacteria. 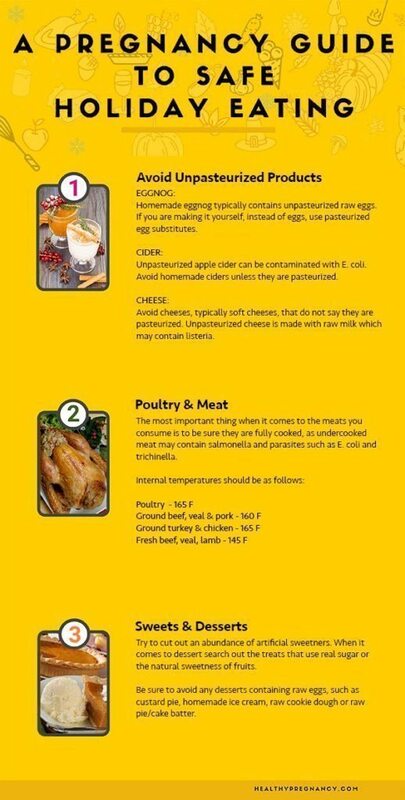 Also a contamination with taxoplasmosis is possible when meat is eaten raw or half raw. Taxopasmosis is an infectious disease caused by the parasite Toxoplasma gondii. This disease can cause blindness in the unborn child as well as mental and physical disabilities and lead to death in the worst case. Another meat product that may be served as an appetizer during the holidays is pâté. Pâté that needs to be refrigerated is not safe for consumption due to possible bacteria. An alternative is canned pâté, which is safe to eat during pregnancy. If sushi or seafood is on your holiday menu, be sure to avoid fish that contain high levels of mercury like white snapper, swordfish and king mackerel. Instead, opt for shrimp, salmon or trout which have lower mercury levels. Dangerous levels of mercury can cause fetal brain damage and cause problems with vision and hearing. Shellfish pose another health risk during pregnancy due to possible bacterial contamination. Raw shellfish, like oysters, should not be eaten during pregnancy. toxoplasmosis; as a result, it is important to properly clean them before eating. The dangerous pathogen can survive in damp soil up to 18 months. While healthy eating is important during pregnancy, holiday drinking has a few limitations as well. Outside of eliminating alcohol and limiting caffeinated drinks, you may not have considered other drinks. Pregnant women should also be mindful of certain popular holiday drinks such as eggnog and apple cider. A potential issue with eggnog, particularly homemade eggnog, is that it may contain unpasteurized raw eggs. Just as with undercooked poultry, there is the danger of salmonella. Unpasteurized apple cider could be contaminated with E. coli. E. coli exposure may cause urinary tract infections and dehydration during pregnancy. An alternative is it to make sure you only drink pasteurized juices. Despite the foods and drinks pregnant women should avoid, holiday eating can still be enjoyed. There are plenty of choices for a worry free holiday diet that is healthy for you and baby.